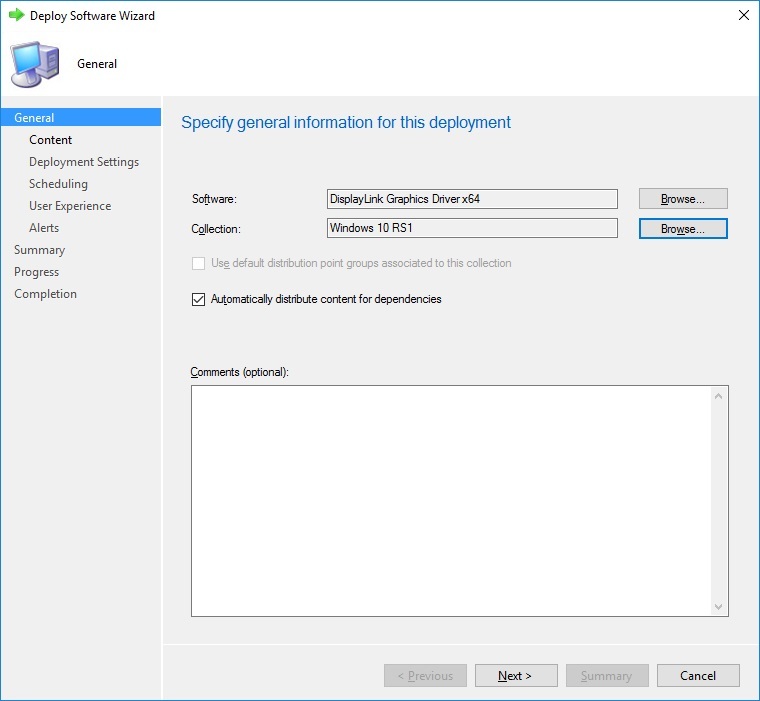 This article is intended to give a Windows Administrator a brief overview of Deploying DisplayLink’s Corporate Installer across a Windows Active Directory Domain. 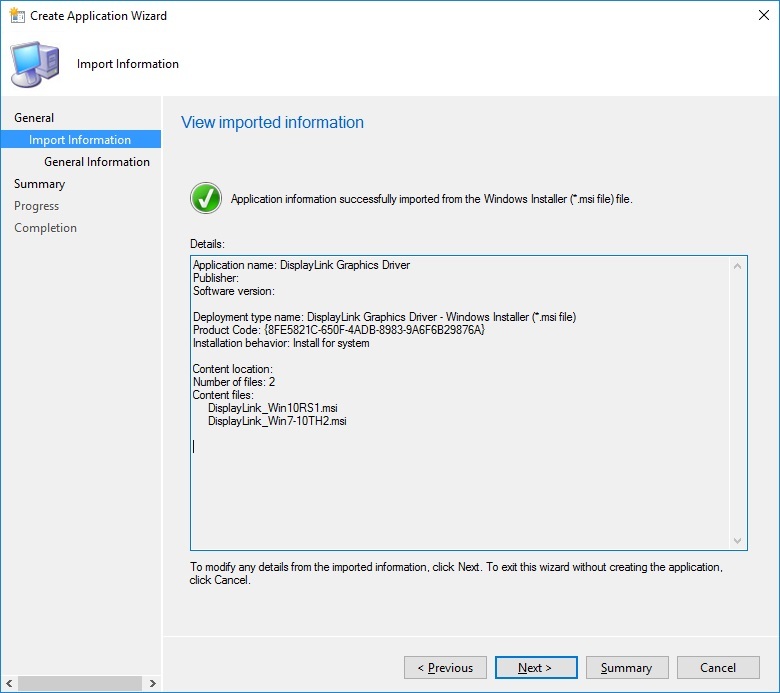 DisplayLink provide the Microsoft Installer files, or a driver package to allow remote deployment of DisplayLink software. This article covers the deployment of the MSI files. Deployment of a driver package, using an INF file, is covered in this article. 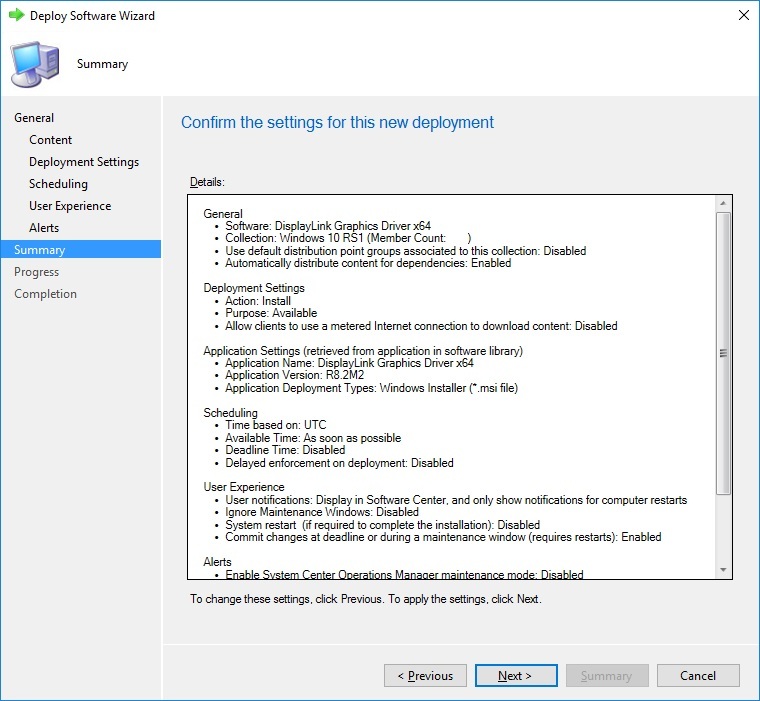 It recommended that a system compatibility check is run on the PC system before deploying the DisplayLink software. 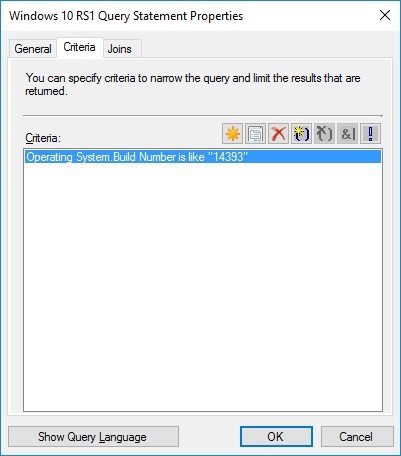 For more information about the System Compatibility Check, please refer to this article. It is not possible to install these MSI files just by double clicking them to install. If User Access Control (UAC) is enabled on the tested machine during an installation, the audio and Ethernet drivers will silently fail to install due to an “access denied” error (even if a user is prompted for elevation). A single MSI file can be deployed. The version of the MSI file differs depending on the Windows OS version, as the graphics architecture changed in Windows 10. Please note: Windows 10 Threshold is no longer supported in driver version 9.0 onwards. A single MSI file can be deployed. The version of the MSI file differs depending on the Windows OS version, as the graphics architecture changed in Windows 10 Anniversary update 2016. From V8.0 a single MSI file can be deployed. The version of the MSI file differs depending on the Windows OS version, as the graphics architecture changed in Windows 10 Anniversary update 2016. Please Note: The MSI used is OS dependant, failing to install the correct MSI can cause issues ranging from the device not working to the computer not booting. Please ensure this is correct prior to deployment. Driver version 9.1 M0 onward removes user interruption caused by driver updates (temporary loss of video, audio and Ethernet during driver swap) while the users are working with their dock on their machines. Driver will be updated at the next machine reboot, if DisplayLink device is detected in use. At the time of writing, our MSI's are available in 32-bit and 64-bit. If you have both 32-bit and 64-bit Operating Systems in your organisation, you’ll need to create two GPOs; one for 32-bit and one for 64-bit. For reference, the 32-bit installer will not install on a 64-bit OS. As this guide assumes knowledge of Group Policy, this section will be brief. 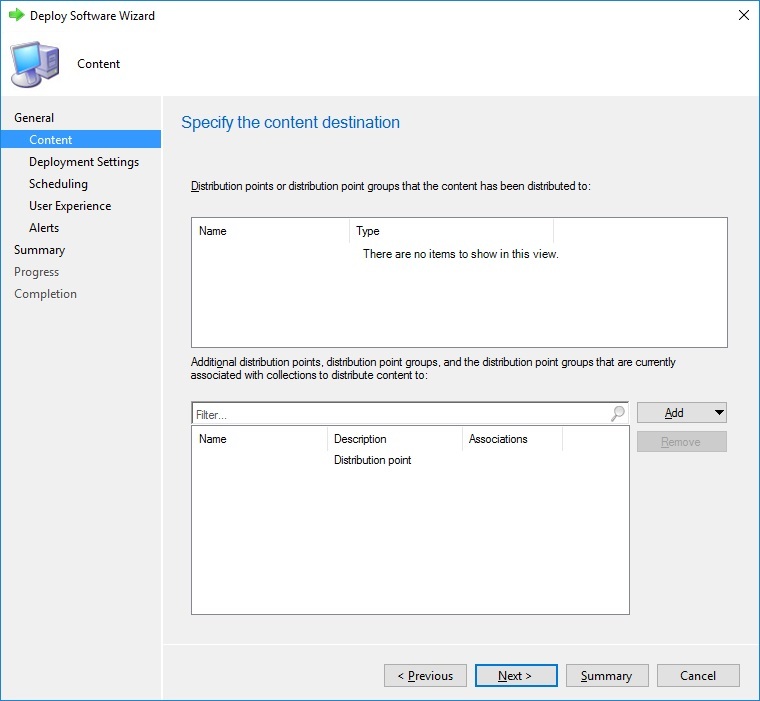 Create a new Group Policy Object (GPO) in the Group Policy Management Console (GPMC) In this guide, we’ll be calling it DisplayLink Device Driver Deployment RS - 64-bit. You may wish to call it something else, particularly if you’re only interested in deploying the DisplayLink driver, and not extra drivers, such as Ethernet. 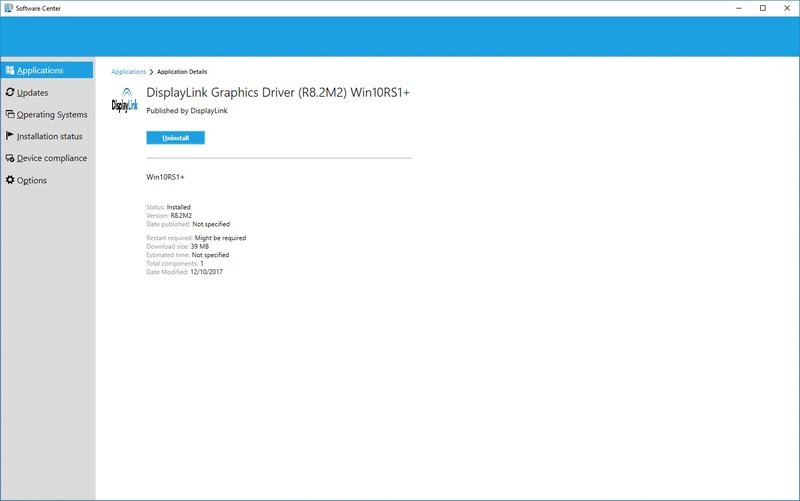 Put the 64-bit DisplayLink_Win10RS1.msi onto a network file share. 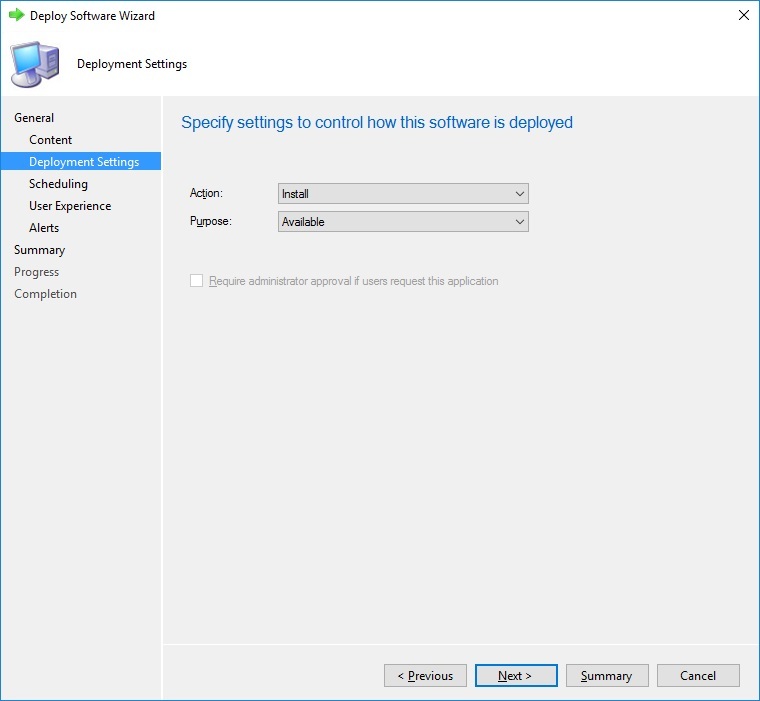 This section will only explain how to deploy the DisplayLink Software using SCCM. 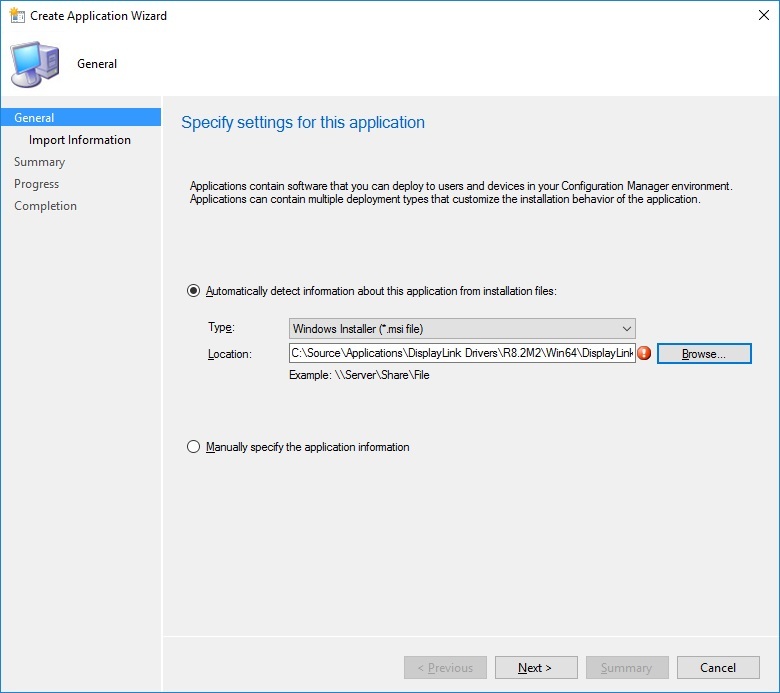 A requirement for this is a working Active Directory and SCCM environment with the Configuration Manager Client installed, or being pushed, to the target machines. This guide will assume admin knowledge of System Center Configuration Manager. 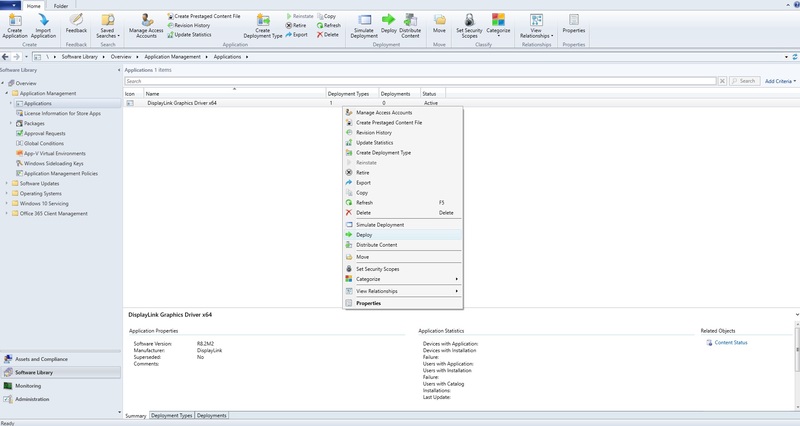 Create or use an existing file share for deploying software and drivers. 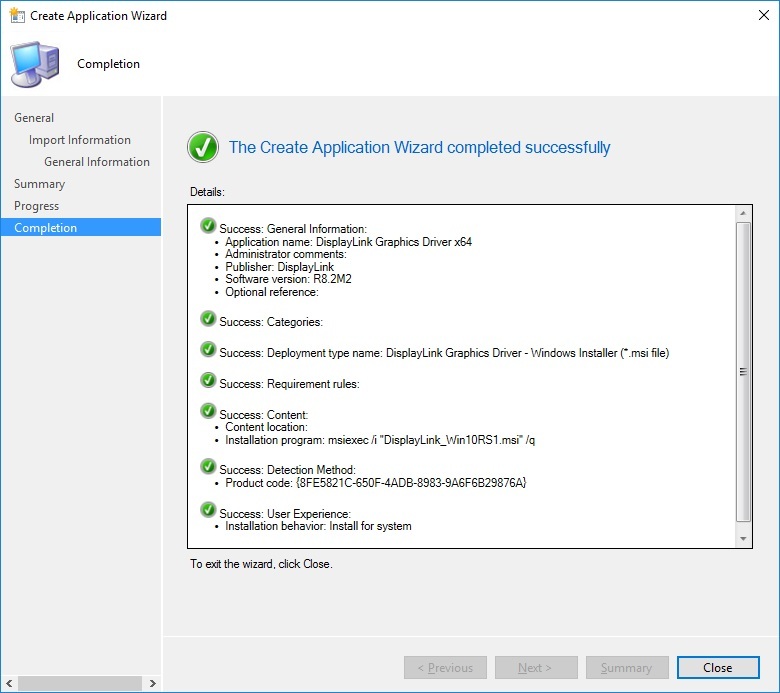 The share must have at least read permission rights for the end users in order for SCCM to install the software on the target PCs. Select “Automatically detect…” and “Type” as “Windows Installer (*.msi file)”. Browse to the network share used and select the “DisplayLink_xxxxx.msi” file. Give the application a name, in this case the 64-bits version is being created. 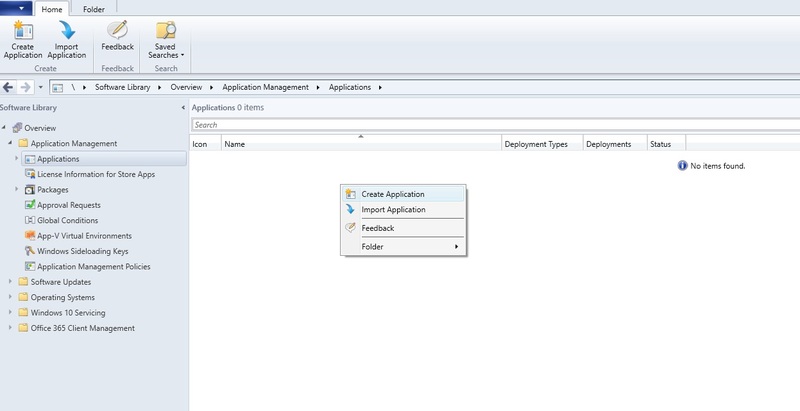 The name given here will appear in the list of applications in SCCM. When the creation of the application is complete, the following screen appears. 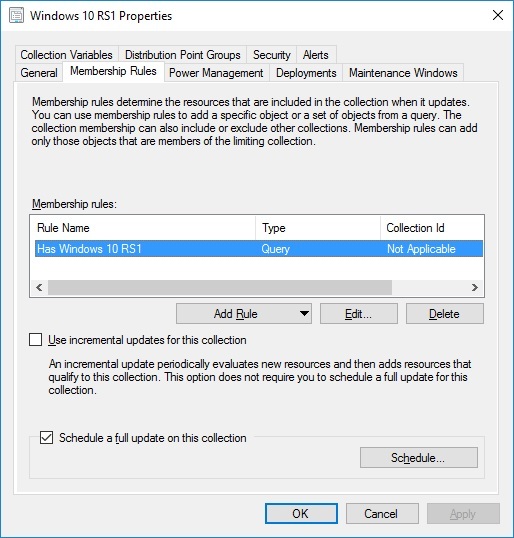 In this example, we are using Windows 10 RS1 (OS build 14393): Create your device collection. Right click and select Properties. Add query statement. Edit query statement to look as below. OK this page and apply to device collection. Navigate back to the application that was created earlier. Righ click on this application and select deploy. Select the device collection that the application is going to be deployed to. Distribute this to your distribution points. Select either an available deployed or a required depoyment. You should now see this page displayed. If your AD DC infrastructure is large, you may need to wait a while for the new GPO to propagate around. Log in as the limited user and plug in the DisplayLink device. If the Drivers install successfully, everything went OK. If the drivers didn’t install, wait a while and reboot again. 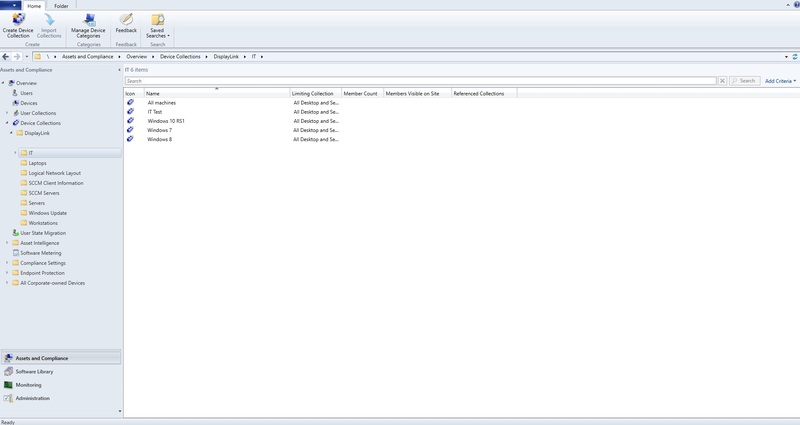 It may be that Group Policy wasn’t refreshed properly on the Test PC, or the GPO hasn’t propagated fully yet. It can sometimes take two or three reboots to pick up the new Group Policy settings. Once everything works as expected, it should then be safe to deploy the solution onto the corporate network. 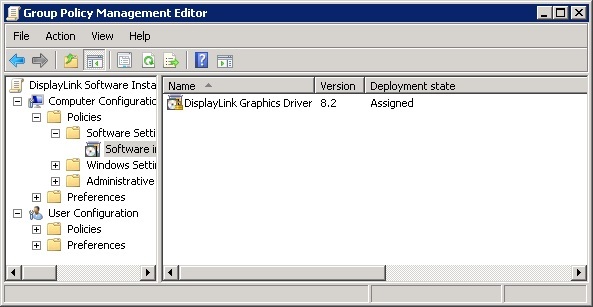 To roll out the driver, simply link the GPO to which Computer OU you want to deploy the driver to. In order for the DisplayLink-enabled hardware to function properly, a subsequent reboot may be required after GPSI has installed the DisplayLink software on the end-users machine. This is normal, as installing a graphics driver under Windows usually requires a reboot, post-installation. 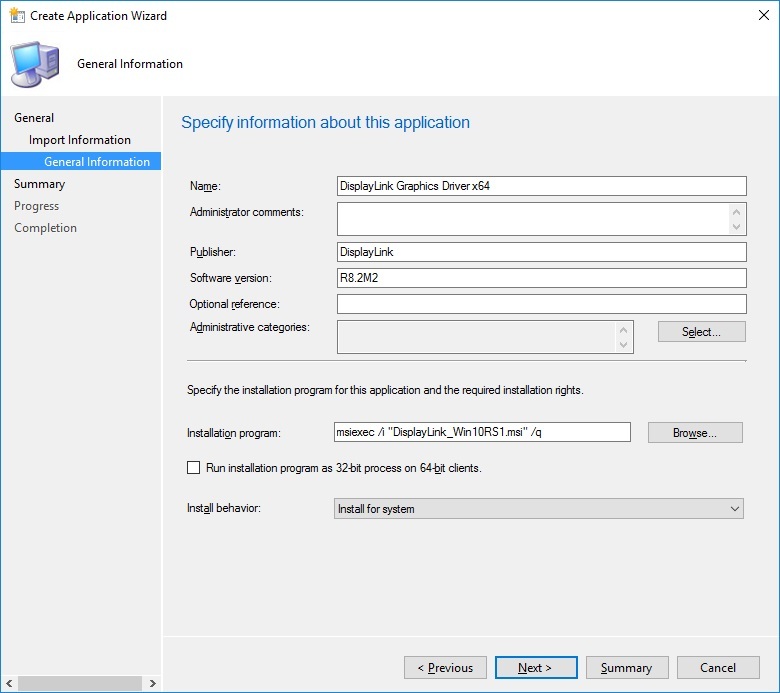 To test that the DisplayLink Driver has installed properly, open Software Center and run the application. If successful you should see the following window.